Schematic illustrating the r-process as it occurs in supernovae or neutron star collisions. Neutrons are rapidly absorbed faster than the resulting nuclei can beta-decay; this allows the r-process to produce very neutron-rich nuclei follow the neutron drip line. There are waiting points located at magic numbers N = 50, 82, 126, where beta-decay is favored due to low neutron-capture cross sections resulting from the closed shells. The cycle then repeats until the next waiting point, creating yet heavier nuclei of elements up to the actinides; the natural abundance of these elements results entirely from the r-process. In the superheavy mass region (A ≥ 270), neutron-induced fission or spontaneous fission are expected to become dominant and end the r-process. Most nuclei along the hypothetical r-process path, however, are unknown. The r-process entails a succession of rapid neutron captures (hence the name) by one or more heavy seed nuclei, typically beginning with nuclei in the abundance peak centered on 56Fe. The captures must be rapid in the sense that the nuclei must not have time to undergo radioactive decay before another neutron arrives to be captured, a sequence that is halted only when the increasingly neutron-rich nuclei cannot physically retain another neutron. The r-process therefore must occur in locations where there exists a high density of free neutrons. Early studies reasoned that 1024 free neutrons per cm3 would be required if the temperature were about one billion degrees in order that the waiting points, at which no more neutrons can be captured, be at the atomic numbers of the abundance peaks for r-process nuclei. This amounts to almost a gram of free neutrons in every cubic centimeter, an astonishing number requiring extreme locations. Traditionally this suggested the material ejected from the reexpanded core of a core-collapse supernova (as part of supernova nucleosynthesis) or decompression of neutron-star matter thrown off by a binary neutron star merger. The relative contributions of these sources to the astrophysical abundance of r-process elements is a matter of ongoing research. A limited r-process-like series of neutron captures occurs to a minor extent in thermonuclear weapon explosions. These led to the discovery of the elements einsteinium (element 99) and fermium (element 100) in nuclear weapon fallout. The r-process contrasts with the s-process, the other predominant mechanism for the production of heavy elements, which is nucleosynthesis by means of slow captures of neutrons. The s-process primarily occurs within ordinary stars, particularly AGB stars, where the neutron flux is sufficient to cause neutron captures to recur every 10–100 years, much too slow for the r-process, which requires 100 captures per second. The s-process is secondary, meaning that it requires pre-existing heavy isotopes as seed nuclei to be converted into other heavy nuclei by a slow sequence of captures of free neutrons. The r-process scenarios create their own seed nuclei, so they might proceed in massive stars that contain no heavy seed nuclei. Taken together, the r- and s-processes account for almost the entire abundance of chemical elements heavier than iron. The historical challenge has been to locate physical settings appropriate for their time scales. The need for a physical setting providing rapid capture of neutrons was seen from the relative abundances of isotopes of heavy chemical elements given in a table of abundances by Hans Suess and Harold Urey in 1956. Not only did their abundance table reveal larger than average abundances of natural isotopes containing magic numbers[Note 3] of neutrons but also abundance peaks about 7001100000000000000♠10 amu lighter than those containing magic numbers of neutrons in their structure. They also realized that captures of free neutrons should be part of any explanation because of the lack of electric repulsion between nuclei and chargeless neutrons. This phenomenology suggested that these lighter subsidiary abundance peaks could result from radioactive nuclei having the magic neutron numbers but roughly ten fewer protons. To achieve this would require radioactive neutron-rich isotopes to capture another neutron faster than they can undergo beta decay in order to create abundance peaks that will decay subsequently to germanium, xenon, and platinum, elements prominent in the r-process abundance peaks. According to the nuclear shell model, radioactive nuclei that would decay into isotopes of these elements must have closed neutron shells near the neutron drip line, where more neutrons cannot be added. The neutron-capture flow must therefore wait for beta decay at those so-called waiting points, which therefore grow larger in abundance similar to water in a dammed up river. For those hitherto unexplained abundance peaks, which are approximately 10 u lighter than the s-process abundance peaks, to be created by rapid neutron capture implied that other neutron-rich nuclei would also be synthesized by the same process. That process, rapid neutron capture by neutron-rich isotopes, is called the r-process. A table apportioning the heavy isotopes phenomenologically between s-process and r-process isotopes was published in 1957 in the famous B2FH review paper which named the r-process and outlined the physics that guides it. Alastair G. W. Cameron also published a smaller study about the r-process in the same year. The stationary r-process as described by the B2FH paper was first demonstrated in a time-dependent calculation at Caltech by Phillip A. Seeger, William A. Fowler and Donald D. Clayton, who found that no single temporal snapshot matched the solar r-process abundances, but, that when superposed, did achieve a successful characterization of the r-process abundance distribution. Shorter-time distributions emphasize abundances at atomic weights less than A = 140, whereas longer-time distributions emphasized those at atomic weights greater than A = 140. Subsequent treatments of the r-process reinforced those temporal features. Seeger et al. were also able to construct more quantitative apportionment between s-process and r-process of the abundance table of heavy isotopes, thereby establishing a more reliable abundance curve for the r-process isotopes than B2FH had been able to define. Today, the r-process abundances are determined using their technique of subtracting the more reliable s-process isotopic abundances from the total isotopic abundances and attributing the remainder to r-process nucleosynthesis. That r-process abundance curve (vs. atomic weight) has provided for many decades the target for theoretical computations of abundances synthesized by the physical r-process. The creation of free neutrons by electron capture during the rapid collapse to high density of a supernova core along with quick assembly of some neutron-rich seed nuclei makes the r process a primary nucleosynthesis process, meaning a process that can occur even in a star initially of pure H and He, in contrast to the B2FH designation as a secondary process building on preexisting iron. Primary stellar nucleosynthesis begins earlier in the galaxy than does secondary nucleosynthesis. Alternatively the high density of neutrons within neutron stars would be available for rapid assembly into r-process nuclei if a collision were to eject portions of a neutron star, which then rapidly expands freed from confinement. That sequence could also begin earlier in galactic time than would s-process nucleosynthesis; so each scenario fits the earlier growth of r-process abundances in the galaxy. Each of these scenarios is the subject of active theoretical research. Observational evidence of the early r-process enrichment of interstellar gas and of subsequent newly formed of stars, as applied to the abundance evolution of the galaxy of stars, was first laid out by James W. Truran in 1981. He and subsequent astronomers showed that the pattern of heavy-element abundances in the earliest metal-poor stars matched that of the shape of the solar r-process curve, as if the s-process component were missing. This was consistent with the hypothesis that the s-process had not yet begun to enrich interstellar gas when these young stars missing the s-process abundances were born from that gas, for it requires about 100 million years of galactic history for the s-process to get started whereas the r process can begin after two million years. These s-process-poor, r-process-rich stellar compositions must have been born earlier than any s-process, showing that the r-process emerges from quickly-evolving massive stars that become supernovae and leave neutron-star remnants that can merge with another neutron star. The primary nature of the early r-process thereby derives from observed abundance spectra in old stars that had been born early, when the galactic metallicity was still small, but that nonetheless contain their complement of r-process nuclei. Either interpretation, though generally supported by supernova experts, has yet to achieve a totally satisfactory calculation of r-process abundances because the overall problem is numerically formidable; but existing results are supportive. And in 2017 new data about the r-process was discovered when the LIGO and Virgo gravitational-wave observatories discovered a merger of two neutron stars ejecting r-process matter. See Astrophysical sites below. Noteworthy is that the r-process is responsible for our natural cohort of radioactive elements, such as uranium and thorium, as well as the most neutron-rich isotopes of each heavy element. Immediately after the severe compression of electrons in a core-collapse supernova, beta-minus decay is blocked. This is because the high electron density fills all available free electron states up to a Fermi energy which is greater than the energy of nuclear beta decay. But nuclear capture of those free electrons still occurs, and causes increasing neutronization of matter. There results an extremely high density of free neutrons which cannot decay, and as a result a large neutron density (on the order of 1024 neutrons per cm3) and high temperatures. As this re-expands and cools, neutron capture by still-existing heavy nuclei occurs much faster than beta-minus decay. As a consequence, the r-process runs up along the neutron drip line and highly-unstable neutron-rich nuclei are created. Three processes which affect the process of climbing the neutron drip line are; a notable decrease in the neutron-capture cross section at nuclei with closed neutron shells, the inhibiting process of photodisintegration, and the degree of nuclear stability in the heavy-isotope region. This last phenomenon terminates the r-process when its heaviest nuclei become unstable to spontaneous fission, which is currently believed to be in the neutron-rich region of the table of nuclides when the total number of nucleons approaches 270; even before this, the fission barrier may be low enough that neutron capture might induce fission instead of continuing up the neutron drip line. After the neutron flux decreases, these highly unstable radioactive nuclei undergo a rapid succession of beta decays until they reach more stable, neutron-rich nuclei. So, while the s-process creates an abundance of stable nuclei having closed neutron shells, the r-process in neutron-rich predecessor nuclei creates an abundance of radioactive nuclei about 10 amu below the s-process peaks after their decay back to stability. The r-process also occurs in thermonuclear weapons, and was responsible for the initial discovery of neutron-rich almost stable isotopes of actinides like plutonium-244 and the new elements einsteinium and fermium (atomic numbers 99 and 100) in the 1950s. It has been suggested that multiple nuclear explosions would make it possible to reach the island of stability, as the affected nuclides (starting with uranium-238 as seed nuclei) would not have time to beta decay all the way to the quickly spontaneously fissioning nuclides at the line of beta stability before they absorbed more neutrons in the next explosion, thus providing a chance to reach neutron-rich superheavy nuclides like copernicium-291 and -293 which should have half-lives of centuries or millennia. The most probable candidate site for the r-process has long been suggested to be core-collapse supernovae (spectral types Ib, Ic and II), which may provide the necessary physical conditions for the r-process. However, the very low abundance of r-process nuclei in the interstellar gas limits the amount each can have ejected. It requires either that only a small fraction of supernovae eject r-process nuclei to the interstellar medium, or that each supernova ejects only a very small amount of r-process material. The ejected material must be relatively neutron-rich, a condition which has been difficult to achieve in models, so that astrophysicists remain uneasy about their adequacy for successful r-process yields. Entirely new astronomical data about the r process was discovered in 2017 when the LIGO and Virgo gravitational-wave observatories discovered a merger of two neutron stars. The localization on the sky of the source of the gravitational waves radiated by the collapse of the two neutron stars into a black hole, but with significant spun off mass of highly neutronized matter, enabled several teams to discover and study the optical counterpart of the merger, finding spectroscopic evidence of r-process material thrown off by the merging neutron stars. The bulk of this material seems to consist of two types: hot blue masses of highly radioactive r-process matter of lower-mass-range heavy nuclei (A < 140) and cooler red masses of higher mass-number r-process nuclei (A > 140) rich in actinides (such as uranium, thorium, californium etc). When released from the huge internal pressure of the neutron star, these ejecta expand and form seed heavy nuclei that rapidly capture free neutrons, and radiate detected optical light for about a week. Such duration of luminosity would not be possible without heating by internal radioactive decay, which is provided by r-process nuclei near their waiting points. Two distinct mass regions (A < 140 and A > 140) for the r-process yields have been known since the first time dependent calculations of the r-process. Because of these spectroscopic features it has been argued that such nucleosynthesis in the Milky Way has been primarily ejecta from neutron-star mergers rather than from supernovae. These results offer a new possibility for clarifying six decades of uncertainty over the site of origin of r-process nuclei. Confirming relevance to the r-process is that it is radiogenic power from radioactive decay of r-process nuclei that maintains the visibility of these spun off r-process fragments. Otherwise they would dim quickly. Such alternative sites were first seriously proposed in 1974 as decompressing neutron star matter. It was proposed such matter is ejected from neutron stars merging with black holes in compact binaries. In 1989 (and 1999) this scenario was extended to binary neutron star mergers (a binary star system of two neutron stars that collide). After preliminary identification of these sites, the scenario was confirmed in GW170817. ^ Isotopes with neutron number N = 50, 82 and 126 numbers of neutrons. These came to be called magic numbers. ^ a b Pian, E.; et al. (2017). "Spectroscopic identification of r-process nucleosynthesis in a double neutron-star merger" (PDF). Nature. 551 (7678): 67–70. arXiv:1710.05858. Bibcode:2017Natur.551...67P. doi:10.1038/nature24298. PMID 29094694. ^ Thoennessen, M. (2004). "Reaching the limits of nuclear stability" (PDF). Reports on Progress in Physics. 67: 1187–1232. doi:10.1088/0034-4885/67/7/R04. ^ a b c Burbidge, E. M.; Burbidge, G. R.; Fowler, W. A.; Hoyle, F. (1957). 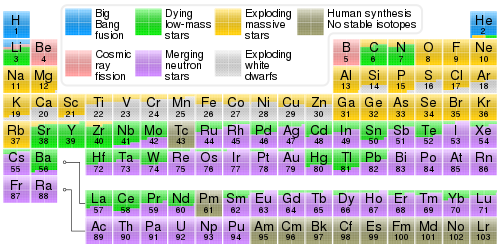 "Synthesis of the Elements in Stars". Reviews of Modern Physics. 29 (4): 547–650. Bibcode:1957RvMP...29..547B. doi:10.1103/RevModPhys.29.547. ^ a b Thielemann, F.-K.; et al. (2011). "What are the astrophysical sites for the r-process and the production of heavy elements?". Progress in Particle and Nuclear Physics. 66 (2): 346–353. Bibcode:2011PrPNP..66..346T. doi:10.1016/j.ppnp.2011.01.032. ^ a b Kasen, D.; Metzger, B.; Barnes, J.; Quataert, E.; Ramirez-Ruiz, E. (2017). "Origin of the heavy elements in binary neutron-star mergers from a gravitational-wave event" (PDF). Nature. 551 (7678): 80–84. arXiv:1710.05463. Bibcode:2017Natur.551...80K. doi:10.1038/nature24453. PMID 29094687. ^ a b Frebel, A.; Beers, T. C. (2018). "The formation of the heaviest elements". Physics Today. 71 (1): 30–37. arXiv:1801.01190. Bibcode:2018PhT....71a..30F. doi:10.1063/pt.3.3815. Nuclear physicists are still working to model the r-process, and astrophysicists need to estimate the frequency of neutron-star mergers to assess whether r-process heavy-element production solely or at least significantly takes place in the merger environment. ^ Suess, H. E.; Urey, H. C. (1956). "Abundances of the Elements". Reviews of Modern Physics. 28 (1): 53–74. Bibcode:1956RvMP...28...53S. doi:10.1103/RevModPhys.28.53. ^ Cameron, A. G. W. (1957). "Nuclear reactions in stars and nucleogenesis". Publications of the Astronomical Society of the Pacific. 69 (408): 201. Bibcode:1957PASP...69..201C. doi:10.1086/127051. ^ a b Seeger, P. A.; Fowler, W. A.; Clayton, D. D. (1965). "Nucleosynthesis of heavy elements by neutron capture". Astrophysical Journal Supplement. 11: 121–66. Bibcode:1965ApJS...11..121S. doi:10.1086/190111. ^ See Seeger, Fowler & Clayton 1965. Figure 16 shows the short-flux calculation and its comparison with natural r-process abundances whereas Figure 18 shows the calculated abundances for long neutron fluxes. ^ See Table 4 in Seeger, Fowler & Clayton 1965. ^ Truran, J. W. (1981). "A new interpretation of the heavy-element abundances in metal-deficient stars". Astronomy and Astrophysics. 97 (2): 391–93. Bibcode:1981A&A....97..391T. ^ a b Abbott, B. P.; et al. (LIGO Scientific Collaboration and Virgo Collaboration) (2017). "GW170817: Observation of Gravitational Waves from a Binary Neutron Star Inspiral". Physical Review Letters. 119 (16): 161101. arXiv:1710.05832. Bibcode:2017PhRvL.119p1101A. doi:10.1103/PhysRevLett.119.161101. PMID 29099225. ^ Boleu, R.; Nilsson, S. G.; Sheline, R. K. (1972). "On the termination of the r-process and the synthesis of superheavy elements". Physics Letters B. 40 (5): 517–521. Bibcode:1972PhLB...40..517B. doi:10.1016/0370-2693(72)90470-4. ^ Clayton, D. D. (1968), Principles of Stellar Evolution and Nucleosynthesis, Mc-Graw-Hill, pp. 577–91, ISBN 978-0226109534 , provides a clear technical introduction to these features. More technical can be found in Seeger, Fowler & Clayton 1965. ^ Zagrebaev, V.; Karpov, A.; Greiner, W. (2013). "Future of superheavy element research: Which nuclei could be synthesized within the next few years?". Journal of Physics: Conference Series. 420 (1): 012001. arXiv:1207.5700. Bibcode:2013JPhCS.420a2001Z. doi:10.1088/1742-6596/420/1/012001. ^ Arcavi, I.; et al. (2017). "Optical emission from a kilonova following a gravitational-wave-detected neutron-star merger" (PDF). Nature. 551 (7678): 64–66. arXiv:1710.05843. Bibcode:2017Natur.551...64A. doi:10.1038/nature24291. ^ Smartt, S. J.; et al. (2017). "A kilonova as the electromagnetic counterpart to a gravitational-wave source" (PDF). Nature. 551 (7678): 75–79. arXiv:1710.05841. Bibcode:2017Natur.551...75S. doi:10.1038/nature24303. PMID 29094693. ^ Lattimer, J. M.; Schramm, D. N. (1974). "Black Hole–Neutron Star Collisions". Astrophysical Journal Letters. 192 (2): L145–147. Bibcode:1974ApJ...192L.145L. doi:10.1086/181612. ^ Eichler, D.; Livio, M.; Piran, T.; Schramm, D. N. (1989). "Nucleosynthesis, neutrino bursts and gamma-rays from coalescing neutron stars" (PDF). Nature. 340 (6229): 126–128. Bibcode:1989Natur.340..126E. doi:10.1038/340126a0. ^ Freiburghaus, C.; Rosswog, S.; Thielemann, F.-K (1999). "r-process in Neutron Star Mergers". Astrophysical Journal Letters. 525 (2): L121–L124. Bibcode:1999ApJ...525L.121F. doi:10.1086/312343. ^ Tanvir, N.; et al. (2013). "A 'kilonova' associated with the short-duration gamma-ray burst GRB 130603B" (PDF). Nature. 500 (7464): 547–9. arXiv:1306.4971. Bibcode:2013Natur.500..547T. doi:10.1038/nature12505. PMID 23912055.